A 32-year-old man is being treated at Illinois Masonic Medical Center after suffering a head injury during a melee inside a Boystown convenience store this morning. "My partner was at the counter to pay for his coffee when the first three people ran in," a CWB reader told us. "The clerk screamed and he ran to the back of the store and then around the counter and out the door as the next wave of five were charging the door." 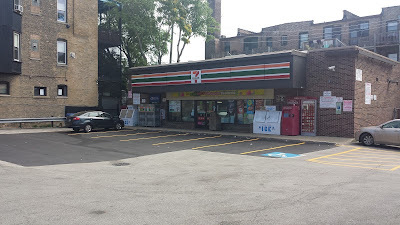 A police sergeant was flagged down just before 6AM Sunday by a witness who reported seeing a group of men beating another man inside the 7-Eleven at Roscoe and Halsted. At the same time, a 911 caller reported that five men had run into the store and started throwing things off of the shelves. The offenders were gone when police arrived on-scene, but cops did find a battery victim who was bleeding from his head. Three offenders are described as black men, two in their teens and the other in his 20's. They were last seen westbound on Roscoe. One of them was not wearing a shirt. "Very sorry to hear someone was hurt," the reader said. "I hope it wasn't the store clerk." Us, too.